The Moon rises high o'er the Wood on this night. Where four Witches gather and cackle delight. Toiling away at their spells and their brew. Looking for Trouble? For it has found you. 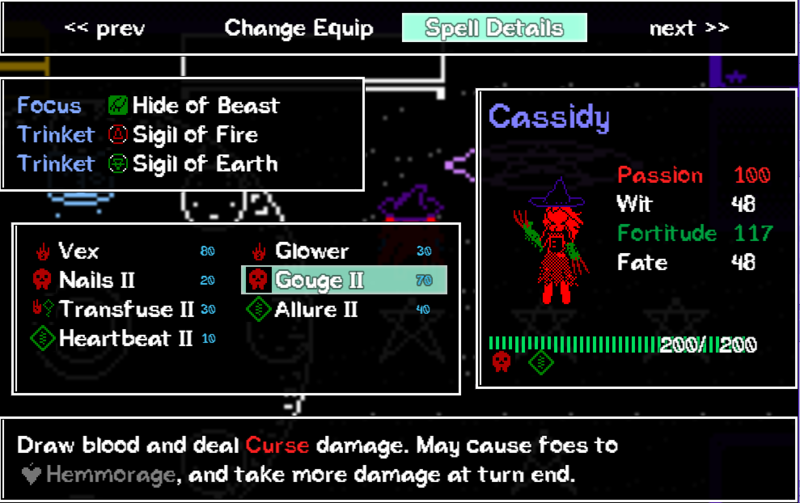 Toil and Trouble is a smaller RPG that revolves around exploring and battling with a party of four Witches. The Woods are often a bit directionless, and our Witches may find themselves in more danger than they'd like if they aren't careful. Stylized after the strategic and turn-based JRPGs of old, the game confronts its players with compelling combat scenarios and customization options. The Witch's spells, Rituals, equipment, crafting system, and especially enemies are Toil and Trouble's most intricately designed features. Around every corner is another new challenge to face. That being said, our Witches aren't without their weaknesses. 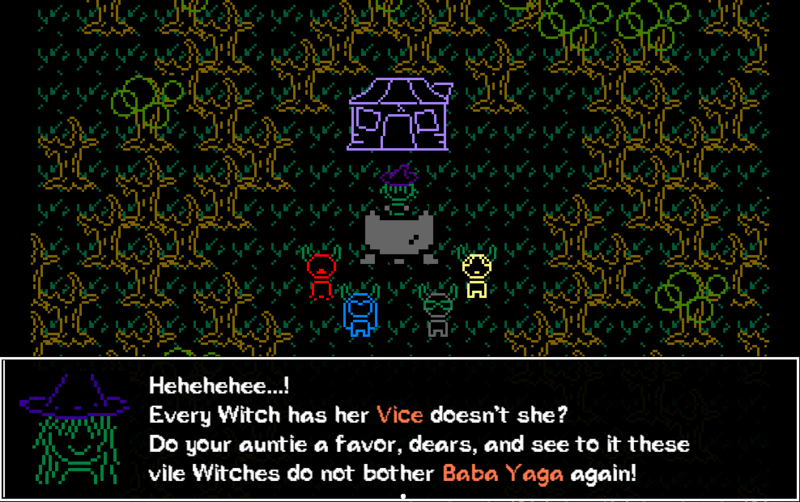 Baba Yaga has brought forth their Vices, demonic faeries that represent figures from their mysterious pasts. And each is ready for a fight. 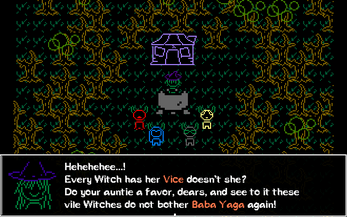 Will the Witches best their Vices and defeat Baba Yaga? Or will they be vexed by the mysteries of the wood and the ghosts from their history? An "Assist Mode" is available for players who just want to have a good time exploring the forest, meeting new bad guys, and watching the story. All art and music is custom made, by me, ScientistWD. This game is free until after Halloween. Best to pick it up soon. A fun game, got about 7 hours out of it. 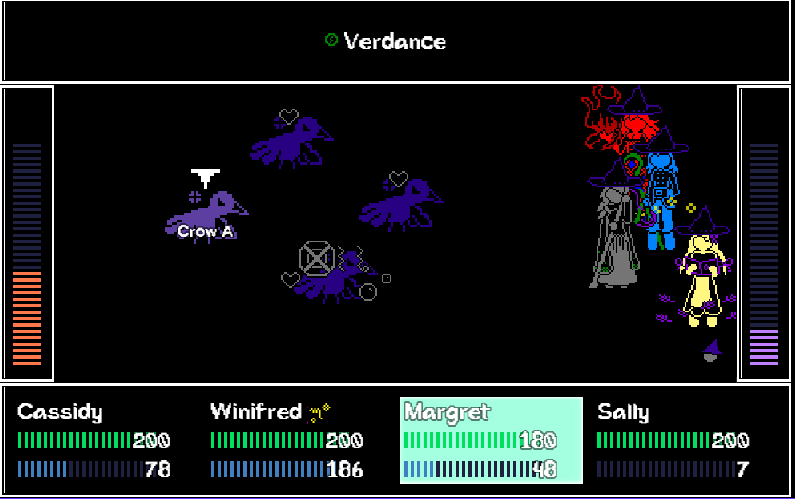 The combat mechanics were interesting and i love that you gave each of the witches a unique sprite for each of the possible focuses, that was a great touch. The story was alright, i weirdly enjoyed having an irredeemable jerk as the leader. Because of the occasional dialogue choices i'm wondering if there were multiple endings though. It had a tendency to crash, but i save compulsively enough that it wasn't much of a problem. All in all, it's a good game. I'm very glad that you enjoyed it, despite its technical goofs. Thank you so much for playing. Stay Wicked! So, I tested your game once more. First I decided to give the Windows-version one more chance and allowed my Virtual Machine with Windows to have more memory. It started, but it flicked like crazy. Thankfully I'm not epileptic. After some time of masochistic gameplay even more visual glitches appeared, for example sprites of characters were replaced by black boxes. Then I tried your Linux version. Everything seemed to work (including save/load function), there were no glitches, etc. But then, out of sudden the game froze my computer and I was forced to use hard reset. I was expecting that the game will freeze at some point (it's typical for RPG Maker MV games), but I was surprised when it froze my whole computer. P.S. By the way, I don't understand why you can't test your game under Linux. Unlike Mac version it doesn't requre any special hardware (although Linux can work on Macbooks too). You just need to install Linux as your second OS. There are some very novice-friendly distributives of Linux, like Ubuntu and Linux Mint. P.P.S. Please add "RPG Maker MV" tag to show that you use RPG Maker MV as your engine. This game is amazing! It has a fascinating mechanical depth to it that reminds me of the Golden Sun series-- equipment and mid-battle buffs change your characters' abilities on a fundamental level-- and different enemy types really do force you to learn new approaches, since they themselves have very different strategies and you can't just power level past them. The art's simplicity is also deceptive, it's all extremely well-meshed and there's a lot more detail than you can see at first. I'm not far enough in the story to give any opinion on the writing, which has so far been rather bare-bones and out of the way, but I hadn't seen any positive comments yet so I wanted to be sure to share. 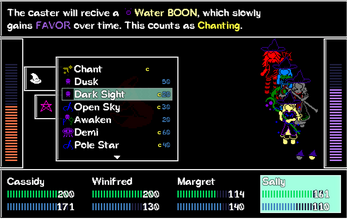 It's already the best thing I've seen to come out of RPG Maker. The developers use buggy piece of bloatware, also known as RPG Maker MV, as their engine. I wasn't even able to play the game :-( . I tried to start it in virtual machine with Windows, but the game thinks that 900 mb of free memory is NOT ENOGH. Then I tried to run it under Wine on Linux, but the gamescreen is black. (By the way, RPG Maker VX Ace works just fine under Wine). 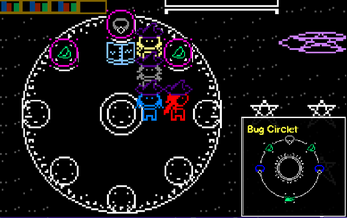 I also must mention lack of Linux version, although it shouldn't be hard to make Linux port with RPG Maker MV. Thank you for bringing this to my attention. 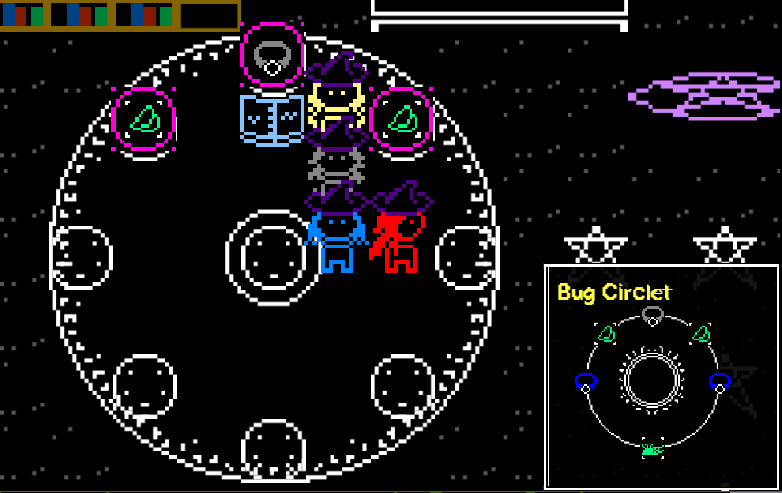 I've added a Linux version just for you, as well as other Linux users that might have otherwise been scared off. I don't have any technical expertise with this sort of thing, but do let me know if it launches and runs and such. If it fails, I might have to simply discontinue it.